Market Profile Chart Reading has become popular in India after NiftyWizard, a twitter user has profited 50+ lakhs and doubled his trading funds in 2 months during the Market correction of SEPT-OCT, 2018. He credits this success to the Market Profile Chart reading technique and years of practical experience interpreting the price action on these charts. Looking at the success of the above daytrader, The topic of Market Profile charts has become a subject of discussion among retail stock traders in India. Many Day Traders are now of the opinion that, Market Profile charts could be the magic formula for successful daytrading in India. Here are 2 ways to use Live Market Profile Charts for Free in India. 1. http://breakingtrade.com provides Free Market Profile Charts for Nifty, Bank Nifty Indices and for selected F&O Equity Stocks. The Market Profile charts on this platform are automatically updated every 3 minutes during Intraday. The site supports automatic chart scanning for multiple instruments with a facility to view the Monthly Market Profile Structure. You need to sign up for Free to start accessing the Market Profile Charts. 2. The Second Method, is a long term practical approach for Full Time Traders. Using the Premium Market Profile TPO Indicator on the Free MetaTrader4 Charting Platform. A Premium Market Profile Indicator is provided as a Free course Material along with The TPO Market Profile Course on the udemy Online Learning platform. The TPO Course is hosted by the TradersClub, UK. The course helps you learn into the basics of using Market Profile Charts and well as get the TPO Market Profile Indicator for Free. To setup your Market Profile Charts using the above discussed second method, read this detailed article on, How to setup a Professional grade Market Profile? 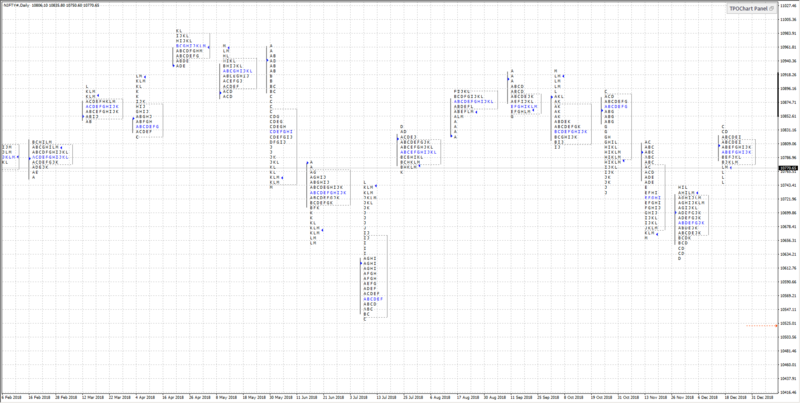 Screenshot from MT4 using the above Market Profile TPO indicator. This entry was posted in Market Profile and tagged market profile, market profile trading. Bookmark the permalink. ← Order Panel Updated on the Fyers Web Trading Terminal.